Slowly but surely, the weather here in the Hamilton area is starting to shift. The rains have arrived to usher in steadily dropping temperatures. Here at Shipton’s Heating & Cooling, our minds have turned to all things heating, and our schedules are quickly filling up with inspection and preventative maintenance service calls. This makes us happy. It gives us a chance to make sure our clients and their families have heaters that will work safely and efficiently when they turn them on for the first time this year. Speaking of safety, in this article, we want to share six of our top safety tips for using your heating appliances this fall and winter. According to Fire Prevention Canada, winter is the most dangerous season for home fires. Reasons vary from more home-cooked stove-top meals to more wood-burning fireplaces that are pressed into service. 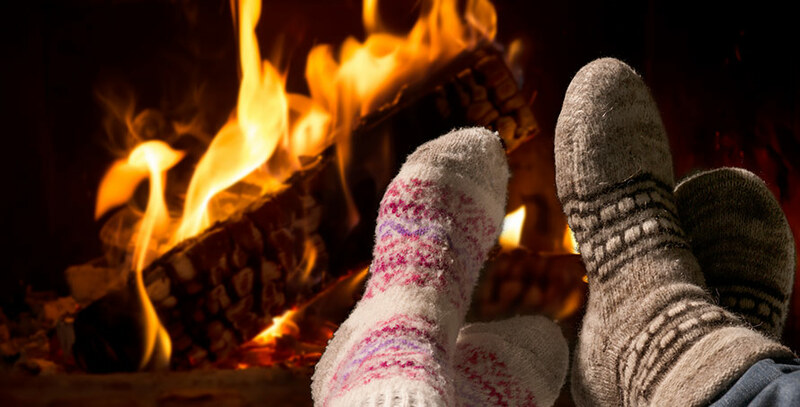 Here’s a sobering statistic: Every week during the winter season, home fires claim the lives of eight Canadians. Clear away all materials, including area rugs, supplies, and shoes, from around each heating element. Make sure this strip is at least 1 metre wide. Put up a baby/pet gate if your home includes children and/or pets who might approach the heating unit. Never pack your woodstove or fireplace with kindling or wood. Use just what you need to start the fire and then keep it going. Use only natural kindling and wood—other materials may be treated with flammable chemicals that could endanger you and your family. Make sure you have one working fire extinguisher for the kitchen and that everyone in your household knows how to use it. Check all appliance cords. If they are frayed, split, or damaged in any way, be sure to replace the cord before you use the appliance again, or buy a new appliance. The Canada Safety Council advises scheduling an inspection and maintenance appointment for your heater or boiler at least once per year near the time you plan to start using your heater. Your inspection should include a general cleaning, filter replacement, repair of any worn or broken parts, lubrication as needed, a thermostat accuracy test, inspection of any connections to ensure fire safety, and recommendations for ways to improve safety during use. According to the National Fire Protection Agency, an estimated 50 percent of all home fires are reported during a three-month time period. Guess which three months they are talking about? Yup: December, January, and February. Here, wood-burning heating elements are constant culprits for starting home fires. The reason is that, with time, tar and creosote from burning wood can build up in the pipes of your stove and in your chimney flue. Also, sparks from burning wood can fly out of the central area and cause nearby furnishings such as rugs, clothes, drapes, and kitchen cleaning rags to ignite. You should always have any wood-burning units cleaned and inspected at least annually, and preferably in the month before you anticipate beginning heavy usage. Ensure you maintain a 1-metre clear area around any stove or fireplace, and that you have a safety screen in front of the burning wood to keep stray sparks from escaping. Finally, be sure that you allow ashes to cool completely before you remove and dispose of them. Otherwise, still-warm ashes may reignite under the right circumstances. Your home may have just the standard smoke alarm or it may also be equipped with a carbon monoxide alarm system. Having both alarms in place is ideal, not to mention legally mandatory, since winter is prime time for carbon monoxide poisoning. Be sure to test your system(s) at least once a month, especially during the heat-intensive winter months. Also be sure to check that your heating equipment vents are clear of debris and working properly to vent outside (otherwise, you risk a carbon monoxide build-up inside your home). The Association of Home Appliance Manufacturers (AHAM) reports that an estimated 3,300 home fires are started annually by portable heating units alone. It is so easy to get careless when it comes to those small, innocent-looking portable space heaters. Common mistakes are leaving clothing or shoes too near the heating grille, forgetting to turn off the unit before leaving the room or the home, using the heater with an extension cord, overloading electrical outlets, or using a heater that has a damaged or frayed cord. Tip 6: Don’t forget about your water heater! Your water heater will also experience heavy demands during the winter. Here, there are potential safety issues for both you and your home. You need to make sure to get your water heater inspected at the same time you have your furnace or boiler inspected. You may also want to consider turning your water heater thermostat down to 120°F (48°C). This ensures you don’t inadvertently scald yourself when cold skin meets boiling water. Now is the perfect time to schedule your annual inspection and maintenance check for any and all heating appliances that may be pressed into service this winter. Our service technicians are prompt, polite, and professionally trained to provide you with top-notch service for any make and model of heater, furnace, boiler, heat pump, fireplace (gas or radiant), or water heater. Contact us by phone at 905-549-4616 or online to schedule your appointment.